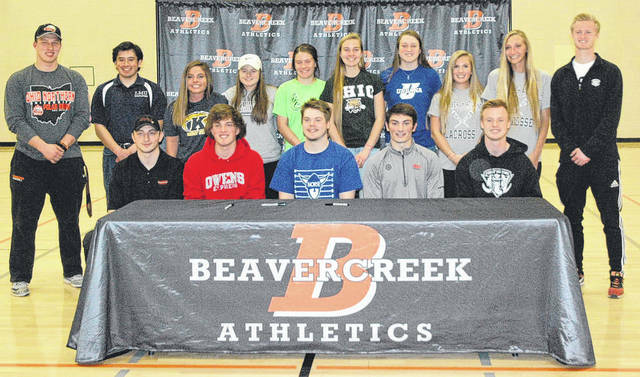 Scott Halasz | Greene County News Beavercreek High School held a signing ceremony April 11 for 16 athletes who will be playing college sports next school year. Front row — Ian Heiland (wrestling, Ohio Northern University); Gary DeMartino (baseball, Owens College); Bryce Neuse (football, Luther College); Dominic Calabrese (soccer, Ohio Wesleyan University); and Ryan Bernt (soccer, Indiana University-Purdue University Fort Wayne). Back row — Noah Koenig (Ohio Northern University, football); William Wells (lacrosse, Lincoln Memorial University); Sydney Smith (lacrosse, Kent State University); Emily Mathes (lacrosse, Wilmington College); Tiffany Haynes (soccer, Wilmington College); Stephanie Pierce (cross country and track, Ohio University); Bailey Draughn (basketball, Urbana University); Cami Bissett (lacrosse, Palm Beach Atlantic University); Madalyn Frye (lacrosse, Palm Beach Atlantic University); and Daniel Donohue (soccer, Indiana University-Purdue University Fort Wayne). Beavercreek senior Connor Davey signs to play football at Wittenberg University. Beavercreek High School held a signing ceremony April 11 for 16 athletes who will be playing college sports next school year. Front row — Ian Heiland (wrestling, Ohio Northern University); Gary DeMartino (baseball, Owens College); Bryce Neuse (football, Luther College); Dominic Calabrese (soccer, Ohio Wesleyan University); and Ryan Bernt (soccer, Indiana University-Purdue University Fort Wayne). Back row — Noah Koenig (Ohio Northern University, football); William Wells (lacrosse, Lincoln Memorial University); Sydney Smith (lacrosse, Kent State University); Emily Mathes (lacrosse, Wilmington College); Tiffany Haynes (soccer, Wilmington College); Stephanie Pierce (cross country and track, Ohio University); Bailey Draughn (basketball, Urbana University); Cami Bissett (lacrosse, Palm Beach Atlantic University); Madalyn Frye (lacrosse, Palm Beach Atlantic University); and Daniel Donohue (soccer, Indiana University-Purdue University Fort Wayne). Beavercreek senior Connor Davey signs to play football at Wittenberg University. https://www.fairborndailyherald.com/wp-content/uploads/sites/50/2018/04/web1_DSC_5730.jpgScott Halasz | Greene County News Beavercreek High School held a signing ceremony April 11 for 16 athletes who will be playing college sports next school year. Front row — Ian Heiland (wrestling, Ohio Northern University); Gary DeMartino (baseball, Owens College); Bryce Neuse (football, Luther College); Dominic Calabrese (soccer, Ohio Wesleyan University); and Ryan Bernt (soccer, Indiana University-Purdue University Fort Wayne). Back row — Noah Koenig (Ohio Northern University, football); William Wells (lacrosse, Lincoln Memorial University); Sydney Smith (lacrosse, Kent State University); Emily Mathes (lacrosse, Wilmington College); Tiffany Haynes (soccer, Wilmington College); Stephanie Pierce (cross country and track, Ohio University); Bailey Draughn (basketball, Urbana University); Cami Bissett (lacrosse, Palm Beach Atlantic University); Madalyn Frye (lacrosse, Palm Beach Atlantic University); and Daniel Donohue (soccer, Indiana University-Purdue University Fort Wayne). 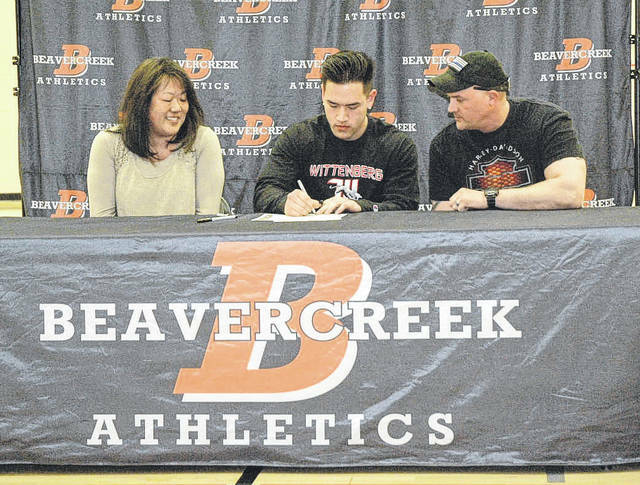 Beavercreek senior Connor Davey signs to play football at Wittenberg University.